China has an uninterrupted civilisation of more than 5,000 years, and the Chinese nation has both gone through sufferings and made splendid achievements. When the West embarked upon industrialisation and embraced the oceans, China fell behind because its emperors chose to shut China’s door to the world, and this made China a victim of foreign aggression. Since modern times began, China was beset by crises at home and abroad, and ravaged by wars and chaos, which inflicted untold sufferings to its people. However, in a century of darkness, the Chinese people, rising one upon another in an unyielding spirit, never stopped searching for a way towards national renewal and prosperity. We will stay true to the founding mission of the Communist Party of China, uphold its leadership and China’s fundamental socialist political and economic systems and be guided by a people-centred development philosophy. From the founding and building of the People’s Republic to the launching of the reform and opening-up program and the shifting of focus to economic development, we have moved away from revolution to reform, from a planned economy to a market economy and from isolation to all-round opening-up. In this process, we have broken free from the fetters of dogma and Utopian thinking, freed our minds and taken a realistic and pragmatic approach, and applied Marxism’s basic tenets in the context of China’s realities. Four to five generations of us Chinese have, going through twists and turns, probed a way forward. Through trials and errors, with many lessons learned and heavy prices paid along the way, we have made great accomplishments and embarked upon a path of building socialism with distinctive Chinese features. Thanks to 70 years of hard work and dedication, we have turned a weak and impoverished agrarian country with backward productivity into the world’s second largest economy, the largest industrial manufacturer, and the largest trader of goods, creating bright prospects for the great renewal of the Chinese nation. The Chinese nation, long among the leading civilisations in the world history, has made unique and significant contribution to human progress. The profound historical and cultural heritage of the Chinese nation is in the genes of its people. What we long for is to see China once again gain its rightful place among the nations of the world and achieve great rejuvenation. The Chinese nation as we know today originates from a number of nationalities that embraced and integrated into one another throughout history. We are a peace-loving, open and inclusive nation that keeps abreast of the times. While keeping the fine Chinese culture alive and strong, we also respect other civilisations and values, and draw inspirations from other cultures. As we continue to follow the socialist path with distinctive Chinese features, we will respect other peoples’ independent choices of paths and systems. The Chinese culture values the teachings that one should help others to succeed while seeking one’s own success, create a world for all, treat others with respect and pursue win-win cooperation. We reject the practices of the strong bullying the weak and self-claimed supremacy. Today, China’s interests and future are closely linked to those of the world. While developing itself, China also wishes to work with all countries for common development and a community with a shared future for mankind. The advances in China in the past 70 years are not a godsend, nor a gift from others. Rather, they are made by the Chinese people through vision, hard work, courage, reform and innovation. By striving to meet people’s aspirations for a better life, we can surely win their support. United as one, we Chinese can surely overcome various risks and challenges. A land of 9.6m square kilometres, a people of nearly 1.4bn, and a history of over 5,000 years: These are the underlying features of China, and they are the source from which China derives confidence in its path, theory, system and culture. We have embarked on a right path that fits China’s conditions and is in keeping with the trend of the times. And we will further improve and enrich socialism with distinctive Chinese features through reform and opening-up. This is a path we believe in, and we will steadily forge ahead along this path. In recent years, problems in the global economy such as lack of new growth drivers, unbalanced development and uneven income distribution have intensified. New challenges brought by new technologies, new industries and new forms of business have mounted. Many countries are increasingly looking inward when making policies; barriers to international trade and investment are increasing; and unilateralism, protectionism and populism are spreading in the world. All these are posing serious challenges to the international order. Will economic globalisation move forward or reverse course? The economic globalisation, which gained rapid ground in the last century, was started by Western developed countries, or the Mediterranean civilisation. In the late 20th and early 21st centuries, technological advances have significantly reduced the geographical distance and other barriers to exchanges among countries and accelerated the economic globalisation process. The BRICS countries, Vietnam, Indonesia and other emerging economies have risen. As a result, economic globalisation has reached a new stage as we now know. Western multinational corporations and financial institutions are the main drivers of economic globalisation. As they seek maximum profit in their operations, they allocate resources to countries with low-cost production factors and sound business environment when building global industrial chains. In this process, China has moved up from the low end to the medium and high end of the global industrial chain. The nearly 1.4 billion Chinese who are enjoying greater prosperity have unleashed huge demand backed by purchasing power. And this has unlocked enormous market potential that no one can afford to ignore. Economic globalisation represents an inevitable trend of history given the enormous potential that derives from harnessing the comparative advantages of countries and enhancing economic connectivity. In response to the problems and challenges in the world today, the international community need to make serious and deep-going analysis, and more importantly, take collective actions in line with the trend proactively. Under market economy conditions, too much emphasis on efficiency often comes at the cost of equity. While there are both internal and external factors that cause a problem, the internal one plays the key role. Therefore we must take a targeted approach to address the problems that have emerged in the process of economic globalisation. Development imbalances need to be resolved through further development. Countries need to press ahead with structural reform, strike a right balance between equity and efficiency, adopt effective policy measures to prevent the worsening of income inequality and fend off the impact on some regions and industries caused by new technologies and market competition, so that all people stand to gain from continued development. What we need to do is make the pie bigger while looking for ways to share it in a more equitable way. The last thing we should do is to stop making the pie and just engage in a futile debate on how to divide it. Shifting blame for one’s own problems onto others will not resolve the problems. To address its problem, China’s choice is to focus on managing our own affairs well. Socialism with distinctive Chinese features has entered a new era, yet China also faces the problem of imbalances in development. The principal issue confronting the Chinese society is that unbalanced and inadequate development cannot meet our people’s ever-growing needs for a better life. We will pursue development as the top priority, promote coordinated economic, political, cultural, social and ecological advancement, and move steadily towards making China a moderately prosperous society in all respects. We in China have continued to carry out reform across the board, resolving many tough issues and navigating dangerous rapids. 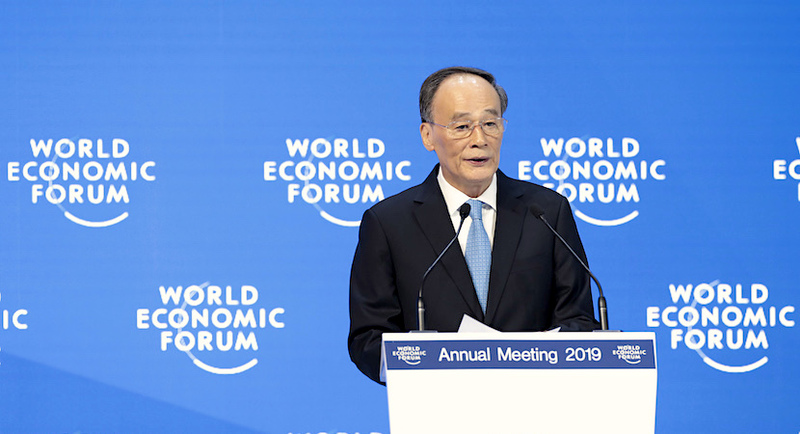 Major headway has been made in supply-side structural reform, digital economy and other emerging industries are flourishing, and an innovation-driven China is taking shape. Decisive progress has been made in key battles of poverty alleviation, with the number of rural people living in poverty cut by over 80m since 2013. Thanks to stronger measures taken, China’s environment has been further improved. The Communist Party of China, the governing party in China, has strengthened itself by strictly enforcing party discipline, and a crushing victory has been secured in fighting corruption. We are meeting here under the theme “Globalisation 4.0: Shaping a Global Architecture in the Age of the Fourth Industrial Revolution”, which is highly relevant. The fourth industrial revolution, with its speed, scale and complexity and the way it shapes human society, represents a significant evolution of the globalisation process. We must work together to shape the global architecture in the age of the fourth industrial revolution with the vision to create a better future for all mankind. It is imperative to respect national sovereignty and refrain from seeking technological hegemony, interfering in other countries’ domestic affairs, and conducting, shielding or protecting technology-enabled activities that undermine other countries’ national security. We need to respect the independent choices of model of technology management and of public policies made by countries, and their right to participating in the global technological governance system as equals. We need to uphold social equity and justice, and ensure technological innovations are made in compliance with the rule of law and internationally recognised norms and that they are guided by us humans, meet our needs and be compatible with our values. We need to prevent technological advances from being turned into tools of committing terrorism and crimes or violating individual rights. In this changing world, making advance is like climbing a mountain. It is commitment, conviction and confidence that drive us forward. In this era of unfolding economic globalisation, all of us mankind share a common stake. As a Swiss proverb goes, “Torches light up each other.” Let us illuminate the path ahead, progress together, ascend to the summit and jointly create a great future for all mankind. HE Wang Qishan is the Vice President of the People’s Republic of China.